We will create the GUI (Graphical User Interface) which contains some buttons. Pressing them we can send some data to our PC’s serial port. Though it is a very basic tutorial but this is a must learn step. Further you can receive, send, monitor data, take some decisions based on that, store hardware data in some databases in your software. We can start with basic mirocontrollers by connecting them with our PC’s serial Ports. We are creating a software which has 2 buttons. Pressing button 1 it sends value ‘A’ to the serial port and Pressing button 2 it sends value ‘B’ to the serial port. You can monitor them via virtual serial port pairing method. If you dont know virtual serial port emulating then see this . Step 1: Start New project in VB 6. 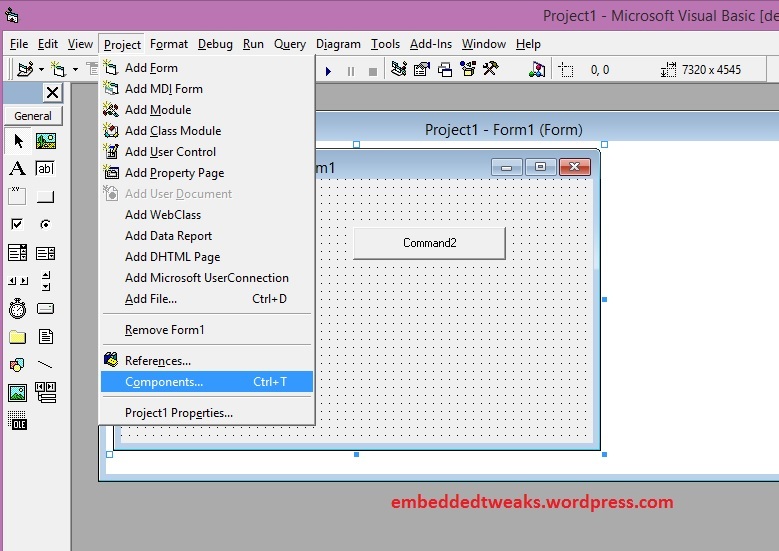 Create standard EXE file project. Step 2: On the main form add two command buttons. If you see carefully then you will find that most of all components are available in the left panel. But as pointed out in the below screen you can see that by default there is no component for serial port available. Hence we need to select it from the project menu, shown in next screen. 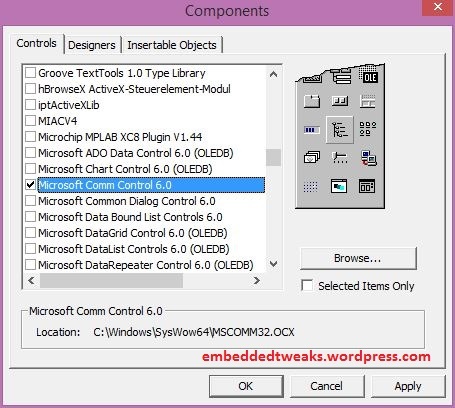 Step 3: Select the Microsoft Comm Control 6.0 as shown here. 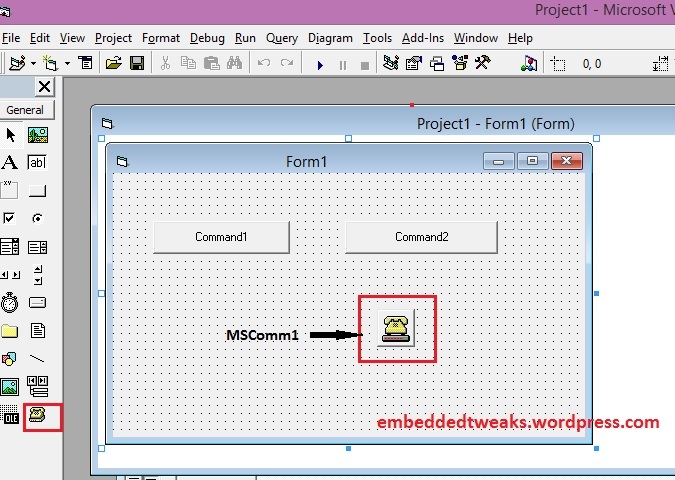 So as in below screen now you will get serial port component in your project. Step 4: Write code for each component individually. This MSComm component is not visible at run time on the GUI. But it operates in the background. The code for configuring the serial port is as shown below. This code should be executed at the time of loading the form. We have created 2 buttons, both can be programmed as follows to send ‘A’ or ‘B’ as per the button. Note: Dont forget to write code to close the serial port you used here. So that after you close this software your other softwares be able to use that serial port. Code for that is shown below. Congratulations. Your task is done. Now further you can do more work related to this by making few modifications. To see serial port hardware interfacing projects with VB, see this section containing VB6 projects with 8051, PIC microcontrollers. Click here to view. If you found this helpful please give your 5 seconds to rate and press Like button on my post. Hello there, I discovered your website by way of Google at the same time as looking for a comparable topic, your site came up, it looks great. I have bookmarked it in my google bookmarks. That is the suitable weblog for anyone who needs to seek out out about this topic. You realize so much its nearly hard to argue with you (not that I really would need…HaHa). You undoubtedly put a new spin on a topic thats been written about for years. Great stuff, just nice! I have recently started a site, the information you offer on this site has helped me tremendously. Thank you for all of your time & work. “The achievements of an organization are the results of the combined effort of each individual.” by Vince Lombardi. I enjoy you because of each of your effort on this web site. My mum takes pleasure in participating in research and it is easy to understand why. Most people learn all concerning the powerful way you present functional thoughts on your web blog and invigorate response from website visitors on this topic so our own daughter is actually understanding a great deal. Take pleasure in the rest of the new year. Your performing a good job. Thank you for sharing superb informations. Your site is so cool. I am impressed by the details that you have on this web site. It reveals how nicely you perceive this subject. Bookmarked this website page, will come back for more articles. You, my friend, ROCK! I found just the information I already searched all over the place and simply couldn’t come across. What a great website. I was studying some of your blog posts on this internet site and I conceive this internet site is real instructive! Keep posting . I have recently started a website, the info you offer on this web site has helped me greatly. Thanks for all of your time & work. “Never trust anybody who says ‘trust me.’ Except just this once, of course. – from Steel Beach” by John Varley. I really enjoy looking through on this website , it holds excellent content . “The great secret of power is never to will to do more than you can accomplish.” by Henrik Ibsen. With havin so much content and articles do you ever run into any issues of plagorism or copyright violation? My website has a lot of unique content I’ve either written myself or outsourced but it looks like a lot of it is popping it up all over the internet without my permission. Do you know any ways to help prevent content from being ripped off? I’d genuinely appreciate it. I have been exploring for a little for any high-quality articles or weblog posts on this sort of house . Exploring in Yahoo I at last stumbled upon this website. Studying this info So i’m glad to exhibit that I have an incredibly excellent uncanny feeling I discovered just what I needed. I most no doubt will make sure to don’t fail to remember this site and provides it a glance on a continuing basis. This is the appropriate weblog for anybody who desires to find out about this topic. You notice a lot its virtually arduous to argue with you (not that I really would want…HaHa). You positively put a new spin on a subject thats been written about for years. Great stuff, simply nice! After research a couple of of the weblog posts on your website now, and I truly like your means of blogging. I bookmarked it to my bookmark website listing and will be checking back soon. Pls take a look at my web page as nicely and let me know what you think. You actually will have to learn this content! I could not presume it either until finally I check out it! I simply want to say I am newbie to blogging and site-building and honestly liked you’re web-site. Most likely I’m going to bookmark your website . You actually come with remarkable articles and reviews. Thanks a lot for revealing your web-site.